Independent Watkins Consultant David & Shannon George (#396925) proudly presents the respected home business with Watkins. TWO Great Reasons to Join This Month! Get $10 Off Your Membership TODAY! Everyone who joins our team during April, 2019 automatically gets $10.00 off their membership fee! Join today and you'll invest just $19.95 for your initial year of membership. (Subsequent years are $29.95, which are not on autopay—you pay if you choose to continue). 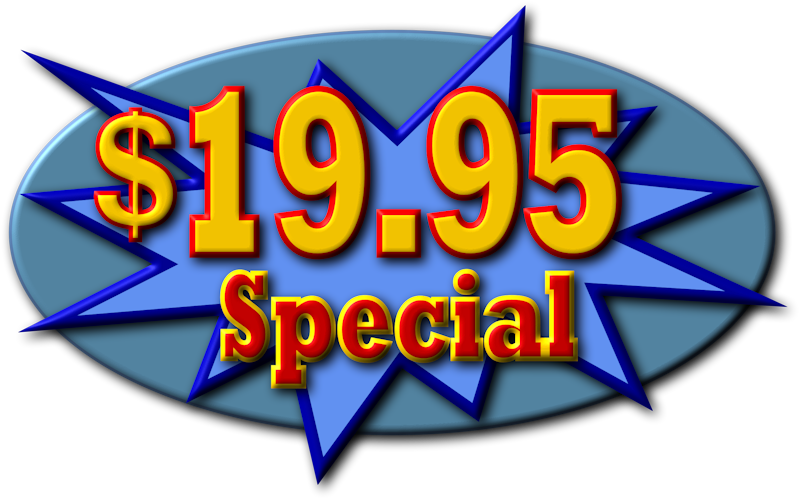 The $10.00 discount saves you one-third and is a nice special to help you get off to a good start. Earn Up to $150 in additional FREE Products! There's a second extra bonus opportunity when you choose to join Watkins as a member of our team this month. Watkins recently achieved 150 years in business. So, we're giving all new members the opportunity to earn $150 worth of free Watkins food products as they take action to build their business quickly. But the gift certificates for free products are really just the icing on the cake... by quickly doing the first steps towards success, you'll also be setting yourself up for solid earnings and bonus income in the months and years ahead. During your first ten days, place an order for $150 worth of Watkins products, and get a free $10 gift certificate. In either the month you join or the following month, qualify for the Bronze Consultant achievement level and get a free $40 gift certificate. In either the month you join or the following month, qualify for the Silver Consultant achievement level and get a free $100 gift certificate. When you get access to our training site the day after you join, you'll learn how to reach those achievement levels to earn one, two, or all three certificates. 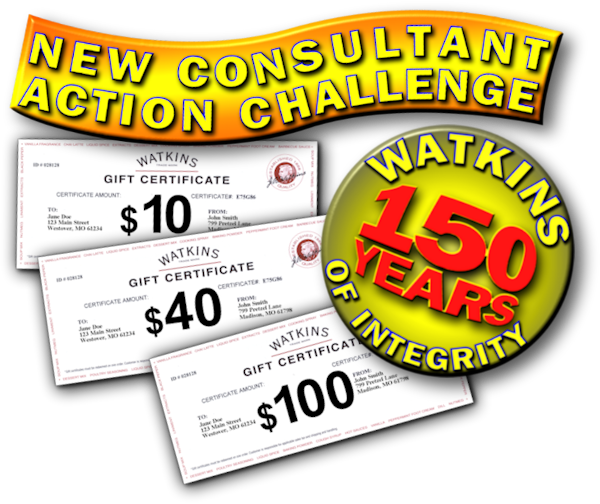 Get all three and you'll have a total $150 in free Watkins food products, in honor of Watkins' 150th year. Cool! And, Yes... Your Friends Can Do It, Too! The day after you join, our team sets up a free website for you just like the one you're viewing now. Share the link so your friends can decide if they want to join during this month's incentive. 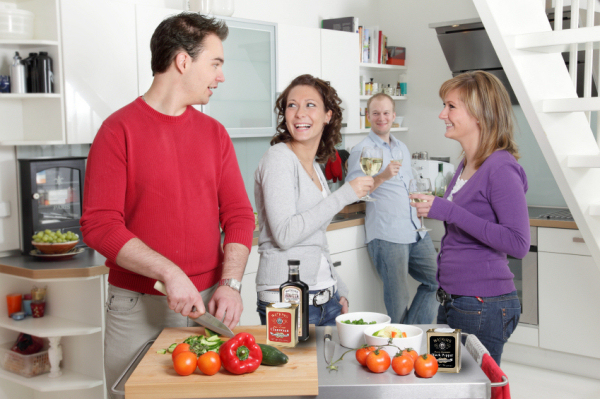 It's fun having other people tag along with you on your journey to earning income with Watkins. Join today to get the most from this promotion. Then, when you get into our training site tomorrow, you'll be able to learn more about the New Consultant Action Challenge. If things don't work out for any reason during your first 30 days, you can get a full refund of your membership fee. The statements made and opinions expressed on this site are those of Independent Watkins Consultants who are recognized by the Watkins Company as official training and support leaders for the Watkins Home-Based Business opportunity, who have published this website as a free business-building tool for our team member David & Shannon George (Independent Watkins Consultant #396925). The statements made and opinions expressed on this site are from these field leaders and have not been specifically reviewed by the Watkins Company. Testimonials are based on personal experiences, and we cannot guarantee these same results for everyone.